In mid-2003, MOTHER 1+2 was released in Japan for the GameBoy Advance. As the name implies, it’s a compilation of the first two MOTHER games. MOTHER 2 was released in North America as “EarthBound” in 1995, but neither MOTHER 1 nor MOTHER 3 ever left Japan’s shores. In fact, neither did MOTHER 1+2. For years, EarthBound fans have hoped for an English language version of MOTHER 1+2, even going as far as pleading with Nintendo for months on end. Nothing ever came of it. After finishing the MOTHER 3 fan translation, I decided to take a little break. About a month later I started looking at other things to hack and translate and eventually wound up at MOTHER 1+2. I did some simple tests and found that the MOTHER 1 part was extremely easy to hack, and within hours I had most of my tools created and already had some major hacks done. So I decided I’d like to do a retranslation of the game. The MOTHER 2 part will be very hard to hack though, so I’m not working on it. If, at some point, Jeffman (also from the MOTHER 3 translation team) decides he wants to work on it though, I’ll do some assistance. But I, personally, have no plans to hack the MOTHER 2 part of the game. The amount of hacking work needed will be comparable to the MOTHER 3 project, and I don’t have the time or energy to go through that again. This is a common and valid question. There’s already a ROM of the NES English prototype out there, commonly referred to as EarthBound Zero. There’s even been a partial English patch for MOTHER 1+2 out for years now. So why bother working on this? A retranslated script. The EB0 ROM has a good number of changes, censoring, and mistakes/issues with plot details. The EB0 script is also very dry because of limited resources. This retranslation can allow for a lot more text, and censoring/changes won’t need to be done. Expanded text boxes, allowing for more dialog text at one time, meaning the text will be nicer and easier to read. Expanded battle text boxes, allowing for more text than before. I still need to actually edit the text to use the new space though. 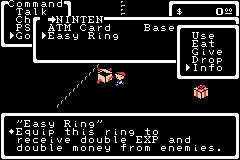 I added a gift box with an “Easy Ring” to Ninten’s room, for those who don’t like to grind for experience and money. The item, when equipped, greatly increases the experience and money you get from enemies while also reducing the amount of random battles. It makes the game much less of a chore. Things like the status screen are a little fancier and more verbose. You can use the L Button in this game much like you can in EarthBound. It makes talking to things/checking things a little quicker. I plan to make a few changes to the font to make the text more readable. 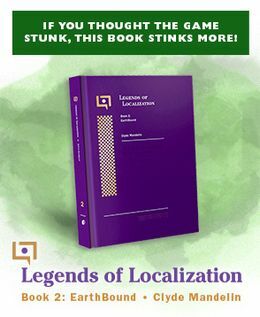 Many of the little EarthBound / MOTHER 3 connections will be left intact in this translation, so fans of the series will surely enjoy that. The EB0 translation changed a lot of things, which broke some of these connections. Translations into other languages will be incredibly easy to do. When will the translation be finished? There’s no set deadline. It’ll basically be done when it’s done. You can always try the NES version or the other MOTHER 1+2 patches if you don’t want to wait. How will this translation thing work? There will eventually be a translation “patch” for download. When this patch is applied to a Japanese MOTHER 1+2 ROM, it will change all of the game’s Japanese text into English. You’ll then be able to play it on the Game Boy Advance emulator of your choice. Very detailed instructions on how to use the patch will be included, so if you’re not good at technical computery stuff, never fear! I own a Japanese MOTHER 1+2 cartridge. Will I be able to put the final translation on it? No, there is no way to delete or replace the data on a cartridge. If you want to play the translation on a real system, you’ll need what’s called a “flash cart” or “flash card”. Will I be able to use my flash cart to play it on a real system? Most likely. ROM hacking is tricky business, and sometimes hacks that work on emulators don’t work on the actual systems. But this translation will most likely work on a real system. What about translating MOTHER 1+2 into other languages? What if Nintendo announces an official English release of MOTHER 1 or MOTHER 1+2? 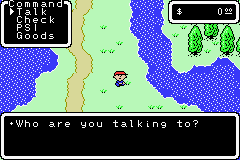 MOTHER 1+2 was released in 2003, so it’s pretty unlikely it’ll get an official translation at this point. Still, I don’t want this project to interfere with an official release should another type of compilation or release be announced. So if that happens I’ll stop this project immediately. Where can I get the Japanese MOTHER 1+2 ROM? Sorry, I can’t give that out. You’ll have to find it on your own. Where can I get a copy of the Japanese MOTHER 1+2 cartridge? There may be other places you can find it too, if you look around. Check local import shops if there are any near you, too. The game was re-released a while back under Nintendo’s Value Selection line, so it shouldn’t be too expensive. Will he be called Giegue, Giygas, or something else? I have decided yet. Figuring out what each individual place, person, enemy, and item should be called is going to be a huge mess, partly due to the fact that these things were changed in EarthBound’s translation. I’ll probably wind up going with how EarthBound does stuff though, since this is mostly for EB fans who have a hard time getting into the first game. Will you implement a variable width font into the game? No, I would have to redesign the game’s entire text system from scratch for that. Instead, I chose to expand the text boxes as far as I could, and I’ll also be paying close attention to the text’s formatting and font to try to make the text a lot more readable and bearable than the NES version. Are you going to call it MOTHER or EarthBound Zero or what? There are two main parts to any ROM translation project: the hacking and the actual text translation. Luckily for us, MOTHER 1 isn’t very complicated in either regard. Mostly, everything here is just a “matter of time” thing, but please understand that I don’t have a deadline for when this project will be finished. I also have many other projects I’m working on at the same time, so more than anything, this feels like a pet project to me. In other words, it’ll be done eventually, but there’s no rush. You can see the latest to-do list here!